Enter your existing and new sign message into the boxes below, and print the results for how many characters will need to be added or removed from your sign! 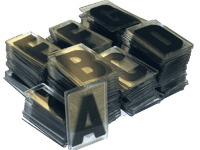 Our letters are injection molded with 0.08" thick high-impact acrylic. This heavy-duty construction prevents warping and keeps the letter in place under most wind conditions. Each letter is molded with a small raised edge that prevents the screen-printed ink from being scratched. The molded-in feet keep debris and ice from interfering with letter placement. Available as full letter sets from our Online Store. Our LED signs allow you to change your message from any internet-connected device!